Hotels are one of the most reliable, secured, and convenient places to stay in especially if the period of stay is only for a limited period of time or during a vacation and a weekend only. But before an individual can get into the hotel rooms and be considered as a hotel guest, he must first complete and submit a hotel guest registration form. 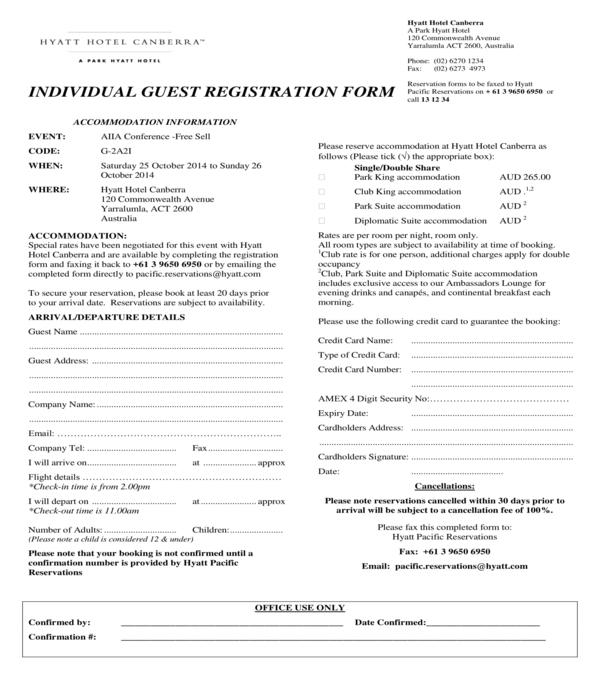 What Is a Hotel Guest Registration Form? A hotel guest registration form is a document which is given to a hotel guest or a client who plans to stay in the premises of a hotel, specifically in the hotel’s function and residential rooms. The form is important to be filled out by the guest in order for the hotel management and the staff to record the personal data of the guest, as well as to meet the requirements of the State with regards to accommodating foreign internationals. Step 1: Incorporate the hotel company brand banner. Upon preparing the document sheet to be used for the hotel registration form, the margins and other measurements should be specified. Then, at the header or the topmost portion of the document, the banner of the hotel should be incorporated. The banner must contain the logo and the name of the hotel along with the hotel’s contact information and their address. Step 2: Add a guest information section. This section should not be limited to the names of the guests only but should also have their addresses, contact numbers, email addresses, as well as their emergency contact information which is essential for documenting who must be reached out to if the guest gets involved in an accident. In addition, the arrival information of the guest must also be included in this section wherein the guest’s date and time of arrival, and the date and time of expected departure will be stated. Step 3: Enlist the room rates and fees. This is where the types of rooms available in the hotel can be presented to the guest along with the rate of each room for a specific number of days. Moreover, the fees which are to be paid by the guest for several additions and hotel requests should also be enlisted such as additional beds, breakfast, and dessert meals to be served to the guest’ room, and the usage of other hotel amenities including the gym and the pool. To indicate which among the offers and the services of the hotel are the preferences of the guest, a checkbox must be placed beside each item which will be marked with a check or the initial of the guest to document his choices. Step 4: Include a credit card authorization agreement. There are some guests who prefer to pay the hotel using their cards and bank accounts which is why it is important to add a bank account and credit card authorization agreement statements in the hotel guest registration form. This agreement will be for indicating the approval of the guest for the hotel management to obtain the payments from his account after their stay in the hotel. Step 5: State the cancellation and late payment agreements. When a guest cancels a day before the expected day of his arrival, the hotel management will not be able to have enough time to revoke the reservation, as well as to inform prospective guests that there is a vacant room in the hotel. This is the reason why most hotels mandate cancellation fees along with late payment agreements for hotel guests who fail to provide the reservation payments on time. 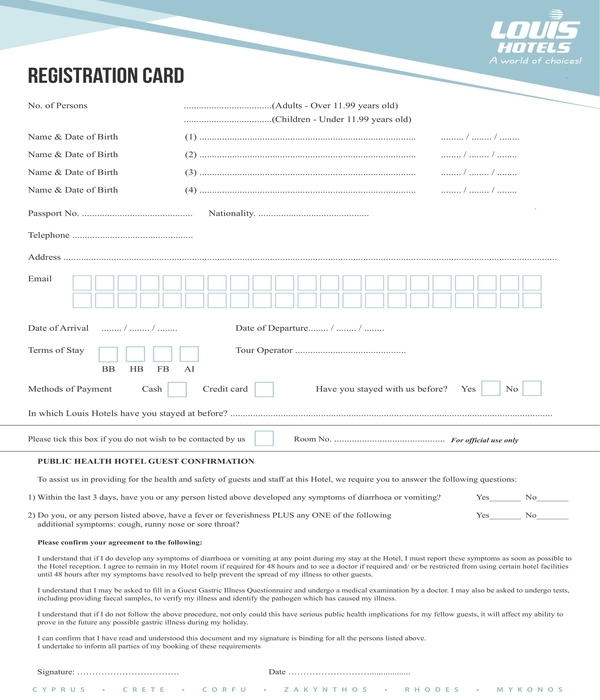 Hotel Guest Confirmation Registration Form – This variety of hotel guest registration form contains two sections and can be printed in a small material to make it into a card. In a hotel guest confirmation registration form, the guest will have to disclose the number of persons who will be staying with him in the hotel room. The headcount of the children must be separated from the adults to help the hotel in determining the number of beds needed to cater to the guests. Aside from the number of the guests, their names and dates of birth will also have to be stated in the form. For the person who is filling out the registration form and is liable in providing the payments for the accommodation and hotel services, he needs to state his passport number, nationality, telephone number, and address as a part of his personal information disclosure. Along with this, the arrival and departure information of him and his guests are also to be indicated in the form as well as his choice of payment method. The second section of the form is the hotel guest confirmation section wherein the guest will be able to read, understand, and inform the hotel management about any health issues he and the other guests have experienced within the last three days. Then, he must affix his signature on the form to indicate his confirmation that the information provided was true and that he will surely adhere to the rules, regulations, and the required protocol of the hotel in the event of emergencies during their stay. Hotel Guest Event and Reservation Registration Form – Events and celebrations nowadays are held inside hotels, not only for convenience but for maintaining privacy and obtaining services which are included in the hotel’s package. 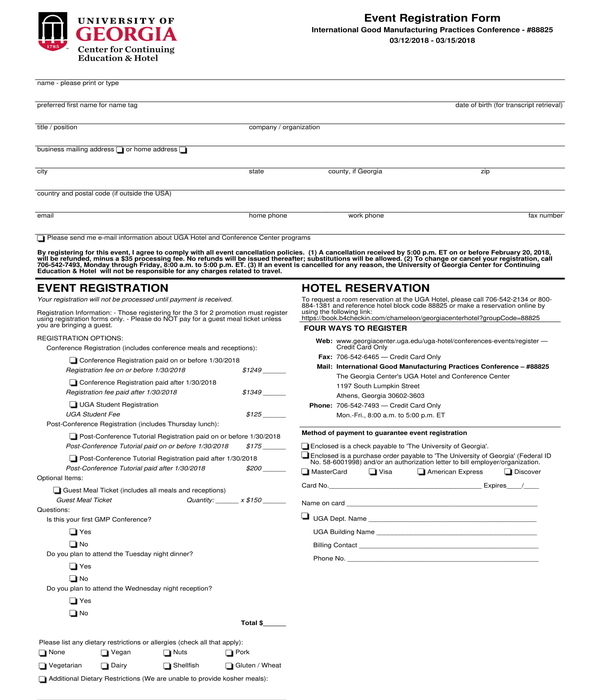 For this, a hotel guest event and reservation registration form must be filled out by any participant of an event who will be staying in the same hotel where the event will be held. 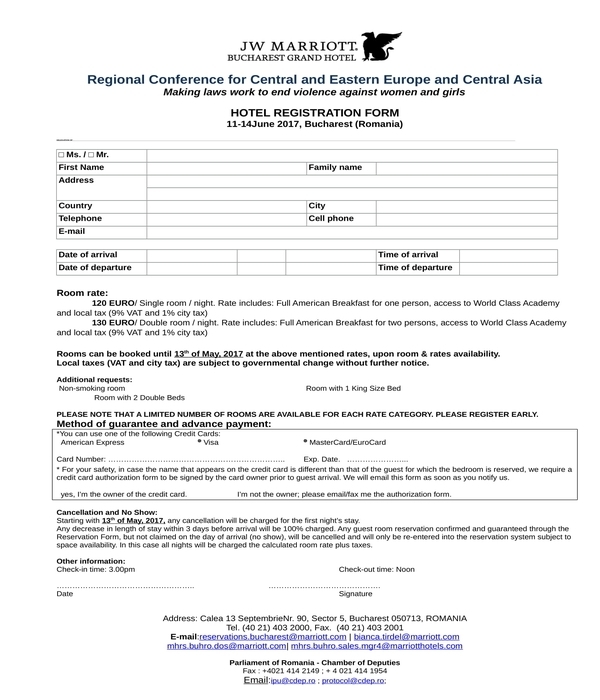 The form contains three sections: the first section is for the general information of the guest, the second section is for the event registration, while the third section is for the hotel reservation. In the first section, the guest will have to state his name, address, and the company or the organization whom he is representing too. The second section will then have the list of the program and their corresponding registration fees which must be paid by the guest along with the specified dietary restrictions of the guest if he will be attending the evening dinner of the event. Lastly, the third section will enlist the ways for the guest to register and book a reservation, and the chosen method of payment of the guest. Hotel Guest Registration Agreement Form – This form not only collects the information of the guest but will also inform the guest about the rules and regulations of the hotel, specifically a liability waiver of the hotel management. To complete the form, the guest must state the package and the room that he will be taking during his stay in the hotel which includes the bed preferences of the guest, special dietary requirements, food restrictions, allergies, and whether there is a special occasion to be celebrated by him. The emergency contact information section of the form must also be filled out by the guest. This will have the name of the guest’s emergency contact person and his information, the relationship of the guest to the emergency contact person, and optional locations or hotels where the guest prefers to be transferred in the event of an emergency. 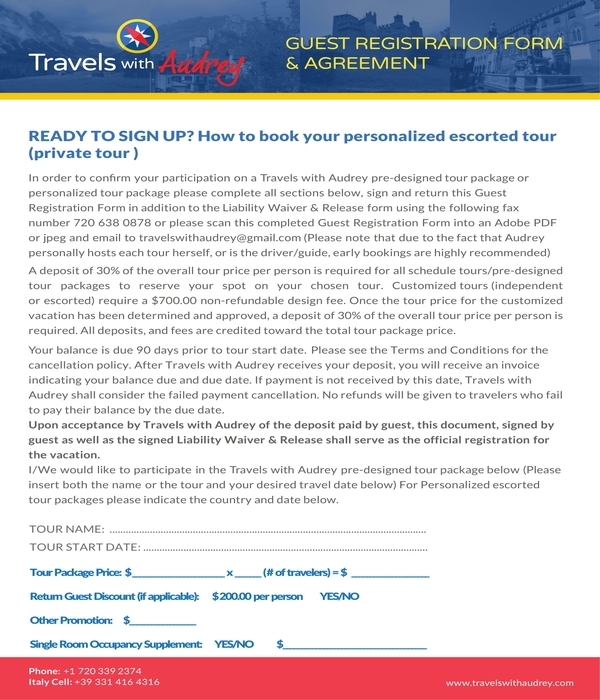 By signing the terms and conditions area of the form, the guest is indicating his approval in the hotel’s rules pertaining to receiving and accommodating their guests and clients. 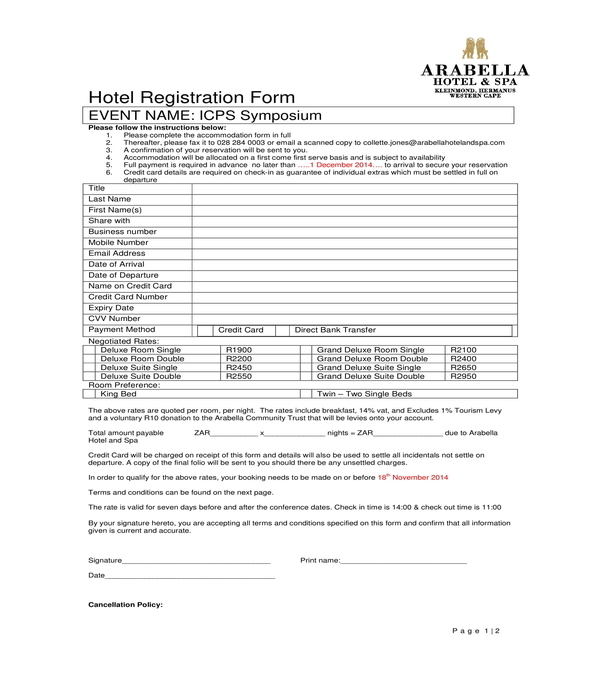 Hotel Individual Guest Registration Form – There are hotels who allow a number of guests to stay in a single room. For these hotels, they must create and prepare a hotel individual guest registration form to be filled out by each guest even if they are accommodating the same room or hotel space. In this form, the arrival and departure details of the guest will be stated along with the credit card information of the guest which will be used for paying the fees and rates of the hotel. Below the hotel individual guest registration form is an area to be completed by the hotel staff only. This is for documenting the confirmation of the hotel for the guest’s intent in staying in the hotel in the specified hotel room or area. 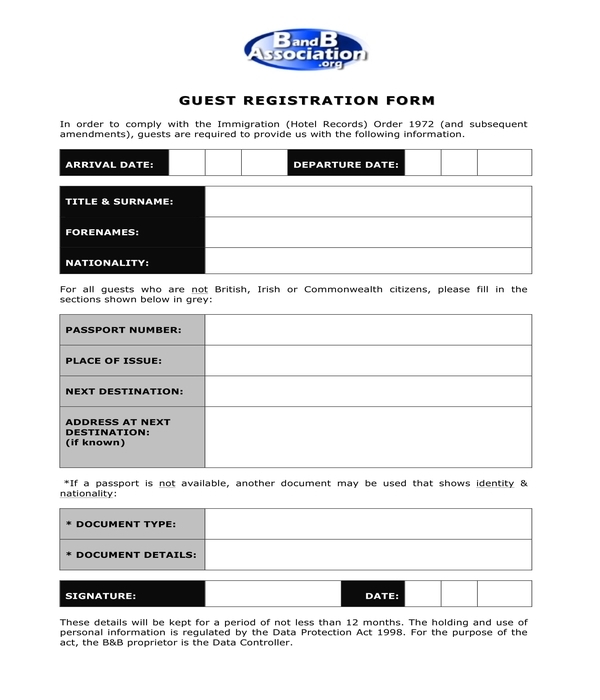 Regardless of the varieties of hotel guest registration forms which are used by hotels and accommodation service providers, the personnel or the hotel staff who will be keeping and documenting the entries of each guest should ensure that the information will not be used and be accessed by unauthorized parties. The guests must also be informed that their information is safe and secure, and will not be used beyond reasons which are inline of their stay in the hotel’s premises unless they will permit the hotel management and other parties who want to obtain their information.